It isn't very often that you make dinner reservations for 1:00 am. But then, it isn't very often that you're in the presence of the simple, wholesome culinary greatness known as Chez Denise. 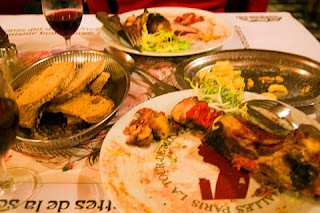 We first saw the restaurant on Anthony Bourdain's No Reservations and fell in love with it before we ever even booked our tickets to Europe, and have been anticipating going there ever since. Of course, we had time to kill until the magic hour, so we went around and took in Paris by night - easily the best time to appreciate the so-called (and rightly so) City of Lights. After checking out the Louvre pyramids lit up from beneath and the glowing lights along the Seine, we made it to Chez Denise. And what can we say? It's as solid as advertised. And as vegetarian-unfriendly as any place endorsed by Bourdain. A round of escargot, a litre of the brilliant house Brouilly, and ginormous côte de boeuf for two, and we had a one-way ticket to Food Coma Town. It didn't help that we finished dinner at around 3:00 am. Of course, we used the caffeine and sugar rush of a couple of coffees and a fabulous rhum baba to give us just enough fuel to make it into a cab and up the stairs to our hotel room. Paris, Je T'aime. Flybe, Je Te Deteste.